Our adult kids... can't live with 'em and can't live without 'em. 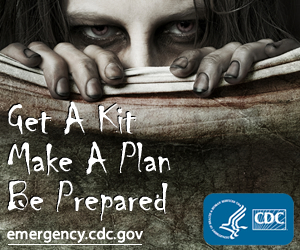 The immanent threat of zombie finger attacks are growing across America at an alarming rate. Is there no stopping the madness? Chris Zombieking, set out to get his fingers tattooed with the vision of an epic zombie attack. The end result is truly inspiring to gaze upon. His fantastical idea was even featured in a recent issue of Bizarre Magazine. It brings back that feeling of childlike fear and wonder all at once. Brilliant! Slap a zombie theme on anything these days and it's almost certain you'll have a breakout hit on your hands before you know it. The gamer nerds at Edmonton-based Fluik Entertainment have done just that with their latest free Office Zombie app which rocketed to number one in the iPhone App Store overnight. The undead app has remained in the Top 20 since it launched on September 21, 2011. 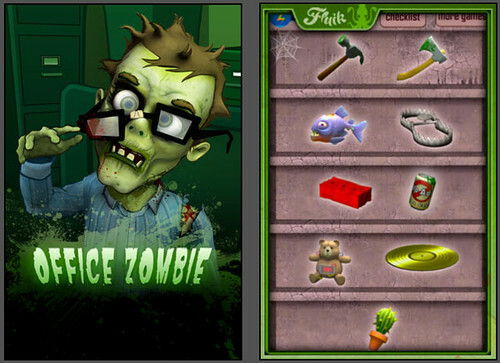 Fluik cleverly reanimated their original chart topping iPhone game Office Jerk, to become a wildly zombified treat that allows players to poke out a zombie's eyeballs by tossing claw hammers, bricks or even beheading the undead desk dweller with three kinds of weapons. Sounds gory right? Not really. Just because I'm staring off into space doesn't mean that I'm enjoying mental downtime. I'm hard at work here mister. In fact, some of the best creative times for me happen when I examine those empty spaces that exist between all the 'doing'. It's in that silence that sometimes I can hear most clearly. Dreaming out loud, inspiration and problem solving can happen at a moment's notice. It can even hit you in the shower. For me it often comes while I'm on a morning walk with Domino, my Jack Russel Terrier. I have no trouble putting my mind to bed and getting a good night of sleep. It's all these waking hours that exhaust my brain. Does everything we create, write, produce out of our passion and pure inspiration have to be for sale? Do we really need to monetize everything we invest ourselves in? Should I monetize my blog? I think not. Some things are meant to exist without having to put a price on them. Some things should remain forever priceless. Dreaming out loud should remain a free enterprise, something that takes place without boundaries. Do you create work that is priceless? I certainly hope you do. I must have this ginormous brain candy for my epic collection of cool zombie junk. This jiggly thinking man's candy is bubblegum-flavored and nearly life-size. Mmm... braaains. Expect to pay $32 dollars US to pre-order your human gummi brains in time for passing out to unsuspecting trick-or-treaters on Halloween. Gluten-free Gummi brains are best served cold to all your undead guests. For my first Zombie Wagon art opening in Seattle last week, I created a batch of zombie cupcakes as a creepy treat for all my pre-dead guests to enjoy. They were so popular that I decided to post a step-by-step recipe so you can make your own. While these do-it-yourself zombie snacks are ideal for Halloween, you'll find them perfect for an over the hill party or any other gathering of the living dead. Meet Scott Martin. In 1969 Scott unwittingly invented the idea of a "honey-do list" while trying to weasel his way out of doing some much needed man-chores around the house on a football Sunday. His wife Liz lovingly coined the term that has haunted domesticated males around the globe ever since. Thanks for that Scott! This custom made Zombie Wedding Cake Topper adds the perfect amount of horror to finally saying "I Do". Designer Beloverly creates each cake topper to resemble you (as close as humanly possible). These amazing wedding cake toppers are hand painted and include a unique degree of blood spatter based upon your own desire for more gore. Expect to pay $75 for the "Zombie Chaser Bride" and $50 for the other undead couples just dying to become man and wife. Minneapolis designer Phil Jones, has produced a perfectly wicked bit of original zombie art he calls "Zombie Plant". Just add brains and watch it grow. Prints of this little potted zombie are available starting at $21 with gallery sized versions of 37" x 28" for $50. Phil also fashioned his art into a nifty MacBook or iPad skin $30, for the zombie geek squad to paste on proudly. I'm dying inside to get a print of this image myself.